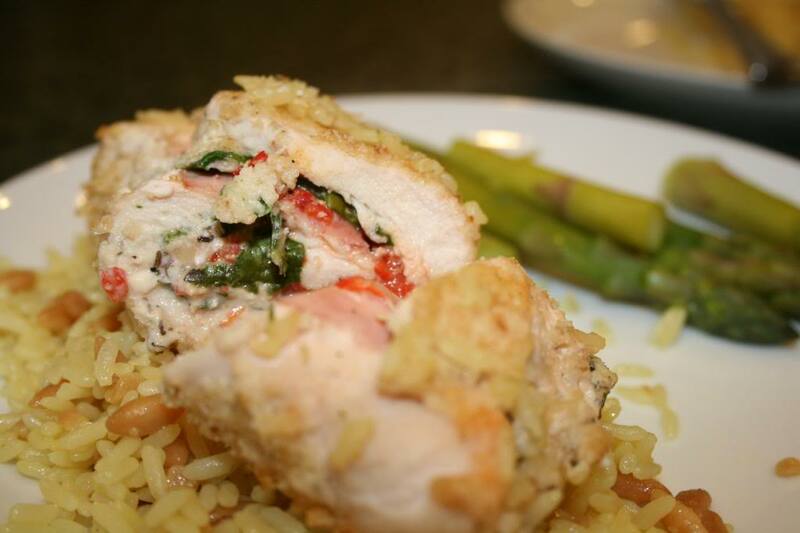 with valentines around the corner i figured a “romeo and juliet” chicken would be perfect for this week’s recipe. for those of you who haven’ t read the greatest love story of all time…….it is the city of verona where the tragic love story takes place. the only tragic thing about this recipe is the slicing of the chicken breasts. it can be a pain, but everything else you’ll absolutely love! 1. Preheat oven to 375 degrees. Butterfly cut each chicken breast half by inserting tip of knife into thickest side of chicken then cutting lengthwise through middle of breast, almost through to the other side. (this is easier to do if the chicken is a bit frozen instead of floppy) Spread chicken breast open flat. Place each chicken breast between 2 pieces of parchment paper. Flatten chicken to 1/4 inch alternating pounding and rolling. 2. In small mixing bowl, combine cream cheese, feta, basil and black pepper; set aside. Chop red peppers and drain on a paper towel. Put breadcrumbs in a bowl. Combine egg and milk in another small mixing bowl. 3. For each chicken roll, cover chicken breast with single layer of spinach, about 2 tbsp of the cheese mix, 1 tbsp of the red peppers and then one slice of the ham. Roll up, jelly-roll fashion, tucking in ends when possible. if needed use toothpicks to hold together. 4. Dip rolls in egg mixture; coat with crumbs. Place seam side down in a baking dish and bake for 45-60 minutes or until chicken is no longer pink and juices run clear. this all depends on how thick your chicken breasts are. i like to pound them thin, so they cook easily all the way through. can’t handle undercooked chicken. these rolls require a bit more “LOVE” than the other recipes i’ve posted, but every now and again you need a little romance in the kitchen! garlic mashed potatoes or a rice pilaf are the perfect MATCH for this recipe. here’s wishin a recipe your sweethearts will love!